Pakistan Ordnance Factories (POF) made a very dangerous and latest gun named Pop Eye. Pop Eye gun can be move on any angle and it equipped with a high definition camera for easy targeting the enemies in day or in night of any secret places without any life loss risk. 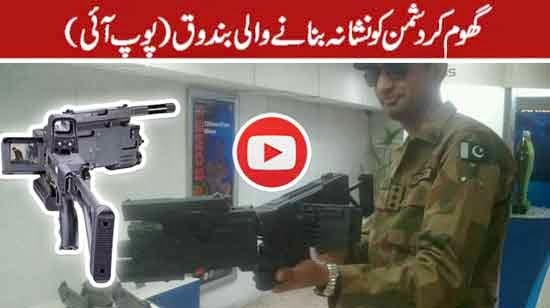 Pop Eye Gun firstly introduced International Defence Exhibition and Seminar IDEAS 2014 At Karachi Expo Center where everyone like this gun and have shown his/her interest to buy it. Pop Eye Gun are using in Zarb-e-azab operation very successfully now a days.